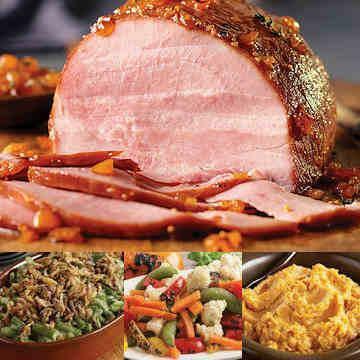 This classic meal features our hardwood smoked ham has a rich flavor the whole family will love, and it's fully cooked. Add a delicious array of trimmings including Green Beans, Roasted Vegetables in garlic oil and Whipped Sweet Potatoes and you have got a ham meal that is sure to impress! Meal serves 4-6. Thaw in refrigerator.�Oven: Preheat oven to 350� F Cover boneless ham tightly and heat for approximately 35-40 minutes. Smoked Ham may be sliced and served cold. Serves 4-6. Do not thaw.�Microwave: Cut slit in film covering tray. Place sweet potato tray in microwave. Cook on high for 4-6 minutes. Remove tray from microwave, stir and let stand for 2 minutes. Remove film. Serve.�Conventional Oven: Preheat oven to 350�F. Remove film from tray. Cover with foil. Place sweet potato tray on baking sheet on middle rack of oven. Heat for 30 minutes. Stir. Place foil over tray and continue heating in oven for an additional 30 minutes until heated through. Ingredients: Sweet Potatoes, Brown Sugar, Whole Milk, Butter (Cream, Salt), Salt. Contains: Milk. Ingredients: Water, Green Beans, French Fried Onion (Palm Oil, Wheat Flour, Onions, Soy Flour, Salt, Dextrose), Mushrooms, Nonfat Dry Milk, Butter (Cream, Salt), Enriched Flour (Bleached Wheat Flour, Niacin, Reduced Iron, Thiamine Mononitrate, Riboflavin, Folic Acid), Modified Corn Starch, Dehydrated Onion, Salt, Chicken Base (Chicken Including Natural Chicken Juices, Salt, Chicken Fat, Sugar, Maltodextrin, Hydrolyzed Corn Gluten, Dried Whey, Natural Flavoring, Yeast Extract, Turmeric), Spices. Contains: Wheat, Milk, Soy.